I have to admit, this feels like a weird post to write. I'm crowdsourcing lead rope recommendations. I have had two lead ropes break in the past few months. One died a traumatic death when Connor was spooked by gunfire or cannons or artillery fire or something when my trainer was bringing him in for dinner. I don't know the whole story, but I found it in pieces in the field, so yeah, it's dead. And then recently my backup lead rope, the thumb piece broke off somehow. And that's the second lead rope that's happened to me on! Clearly, I'm buying inferior lead ropes. 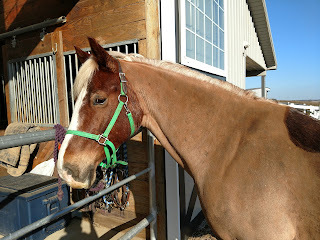 Anyway, I'm tired of having to wedge my fingernail into the clip to get it off my halter, so it's time to go shopping. 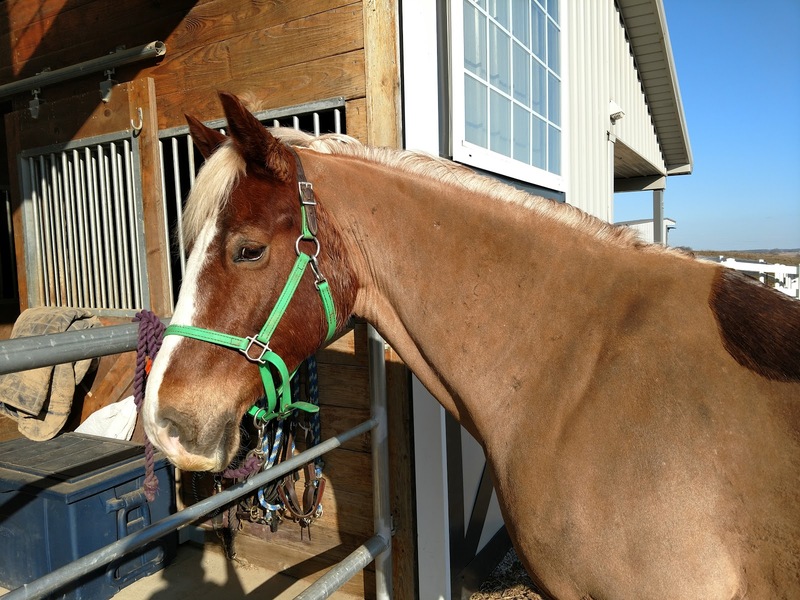 - I really want this one to last because buying lead ropes is just a boring way to spend a dollar, so if you've had one that's lasted forever, I want to know about it. So tell me - what's your favorite and why? I like the Blocker Lead Line Rope 10' that I bought from Riding Warehouse back in 2016. It's long, not slick, pretty hardy, doesn't snag easily, not super bulky by the clip, and reasonably affordable. In my search to find the one I bought I saw several $50 lead ropes...they are longer, training, ropes but STILL!!! omg, NO. $50 lead ropes OMG no way!!! Another vote for the Blocker lead rope! I love mine, I've had one for upwards of 5 years and it's survived several pull-backs when tied and the halter broke, but the lead rope didn't. I now have 2, one for each horse and they're my favorite. Noted, don't take L's advice, haha. Honestly your post reminded me about my broken lead rope, so thanks for the inspiration. I love these cotton lead ropes because I hate poly ropes! They are slippery, overtighten, and feel gross in the hands. They seem to last longer than the twisted cotton ones that come unravelled. That's a contender for sure, thanks for sharing that! I always used the Weaver twisted cotton lead ropes. I never had a problem with them breaking before my horse did something drastic to break them -- but it was Murray, so take that for what it's worth. One frayed from being tied to baling twine during an emotionally fraught bath time, and several others have snapped (appropriately) at the trailer or during whatever stupid shenanigans my horse was pulling. They tie tight, they hold well, and they break when they need to. I've never had a hardware problem with one either, and I cut the snaps off my broken/useless leadropes to keep for other purposes. They aren't so expensive that I feel stupid buying more of them. Ok that's a good point, they DO need to break under certain circumstances. That sounds like a good option, thanks! Another vote for Weaver cotton! The 10' length is perfect and they're a good diameter. I hate leads that are too skinny. This. Plus mine have actually held up to my stupid equines for years and years. Yup, I basically buy one of these every time I'm at a tack store just so I have backups everywhere. They're straightforward and the right size, length, and strength. I know, leadropes are always such an afterthought for me! The Kensington ones are pretty but they look like the slick kind - no bueno. And have used it every day for over 7 years now and it’s still completely perfect. The snap is super heavy duty and the rest of it has also worn like iron. I have the same one...it came with Bridget and was obviously someone's old ugly one they wanted to get rid of because it was very well used looking even then. 6 years later, it's still in near daily use and attached to her ugly halter that hangs on the gate in the field. It's rusty and the very end is getting frayed, but perfectly functional and outlasted 3 good quality nylon halters! My only critique is that the length is a bit shorter than my other ropes (not ruling out the possibility that someone in the past cut the end off though, hence the melted/frayed end :) Anyway, I'm pretty sure that thing is going to outlast us all. I should also add that it was my go to when we were teaching Sophie to tie and she was sometimes...dramatic. (Was kind of hoping she'd kill it rather than her much newer halter, to be honest) However, it survived all her best efforts to escape with no noticable damage. I recently bought this one: https://www.smartpakequine.com/pt/rambo-deluxe-lead-17705 and so far I really like it! It's soft, ties well, and is a good heft and length. I can't speak to its longevity since I haven't used and abused it for that long yet, but it's woven as opposed to twisted, so it seems like it'll hold up well! I bought a poly nylon lead from Dover 4 years ago and it’s still like new. I like the weight and softness of it. I use yacht rope. 15 foot length with a loop spliced onto the end. I never leave a halter on so I attach the lead to the halter and leave it. Easy to tie, never had one overtighten, and I have a puller. Can be used as reins if I feel like riding in from the field. it's... a lead rope lol. It's nice and long, the rope is not too thick, and it sits out in the rain/mud/etc all day and looks fine. Ha, should have read comments first. Arteriole already shared. I second her!